. : Farm Forest Line - Planting trees and sowing seeds :. It is common practice for pines and deciduous trees to be grown in open nursery beds then transplanted as open rooted stock. This not only eliminates the need for pots but also makes handling and transporting large numbers of trees very easy. 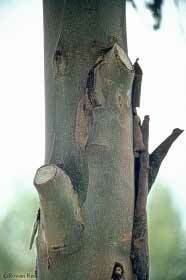 Alternatively, trees and shrubs can be direct sown or planted as cuttings directly into the soil. The choice of method depends on many factors not the least being the cost, the availability of the desired genetic material, and the purpose of the planting. Open rooted seedlings and cuttings have been used in both plantation forestry and ornamental plantings for many years. The trees are grown in nursery beds over the summer months (in temperate areas) and their roots pruned regularly during the growing season. The trees are then lifted in winter for planting. Conifers need to be planted within a few days of lifting whereas deciduous trees can be held for much of the winter as long as their roots are kept moist. Eucalypts and other natives have been grown in the same way although the trend for these species is to grow them in small pots. Pots, tubes and trays of fused small pots are the most common method of growing most native trees. Whilst large pots have the advantage of containing more soil they are cumbersome and expensive. Experience suggests that for most species, planting small seedlings (15 to 30cm) is best for early growth and survival. Along with obvious cost savings this has seen the increased use of trays containing as many as 64 small pots. The small seedlings can be carefully pulled from the tray and planted using a number of simple planting tools. Larger seedlings may be warranted where there is a risk of flooding or sand movement damaging small plants. Larger pots or tubes allow the farmer to more easily care for the trees while waiting for the right time to plant. For more than 100 years farmers have been direct seeding native trees. There are now many different types of seeding machines specially designed for different soil types. In light sandy soils they generally scrape away a thin layer of top soil and sow the seed in a channel. In heavier soils where water is likely to flow along a channel, sowing onto moldboard-ploughed ground has worked well. The major concern is the control of grass and weed competition. Once established it may be necessary to thin out or in-fill to ensure the right spacing.